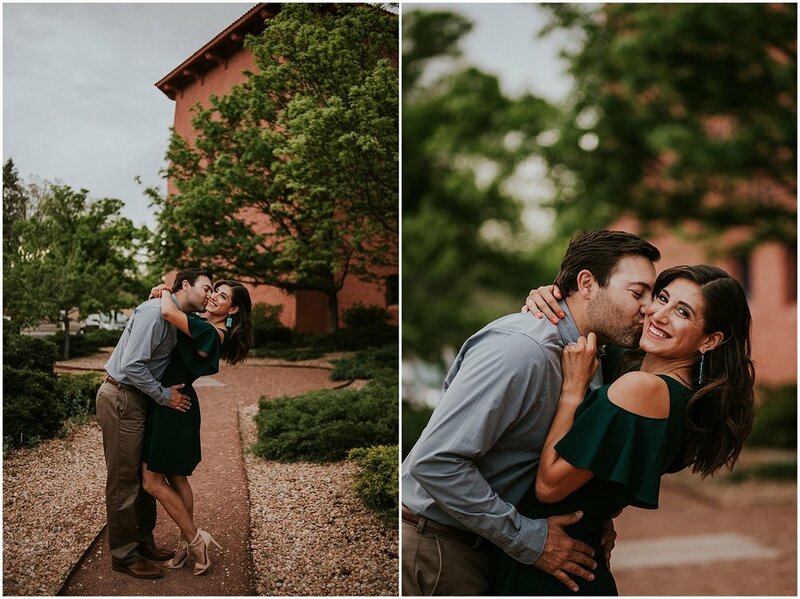 I was ecstatic when Aurora and Juan asked me to photograph their engagement sesh as well as their wedding day. I’ve photographed these cuties at several weddings I’ve photographed and I’ve been rooting for Aurora to get that proposal because we had both patiently waited years for our boo thangs to pop the question. Their outlook on life, passion for their careers, and love for one another is truly remarkable. They’re literally #couplegoals! Juan and Aurora knew each other from growing up in Taos, New Mexico and often exchanged awkward hellos at their little brothers baseball games or quietly just shooting the basketball around. They always knew each other, they both played basketball in middle school, but Aurora said that Juan was “way too cool to talk to me”. Aurora lived in Tucson, AZ during high school and they lightly promised to hang out every summer when came back to Taos, but they hardly ever got around to it. Juan would sometimes message Aurora on Myspace in high school or Facebook in college just to say hey, and she never took it too seriously. During freshman year of college he offered to visit Aurora in Arizona randomly. When she was living in Charlotte, NC and going to school, Juan would reach out, but they were just in their own worlds living their own lives. She said she honestly didn't notice him as a guy she might be interested in until he drunk called her early one morning. His voice and his Norteño accent was unexpectedly comforting from across the country. They had their first playful conversation of "Why did you call me?" and him, "Why did you answer?" and then laughed about it over the phone. They have disagreements about their first date, but they have been together for over 7 years. Aurora thought the things they did were just friend hang outs: skiing, playing pool, hiking, and going to his little cousins baseball games. Juan insists they were dates. And that summer where they finally, actually got to hang out was cut short when Juan received an internship in Port Aransas, TX, although they did keep in touch. Aurora said that Juan seemed really lonely as the summer dragged on in Texas and so she decided to send him a care package. The day Juan got the package he texted her, "Thank you for the package, I love you so much!" with a hundred exclamation marks and she was completely shocked by it. They. Were. Just. Friends. Then she got on Facebook and saw everyone posting happy birthdays on Juan's page that day. It was a total accident the package arrived on his birthday. Aurora mulled over what to say back and talked about it with her friends when it started feeling like this could really be something between them. However, Aurora was entering her last year of college in North Carolina and had an uppity attitude about dating a guy in New Mexico, and she wasn't about to get into line for Juan Amado with other girls from home. She tried her best to fight it and to keep their awkward friendship an awkward friendship. Juan came home the night before Aurora flew back to North Carolina. He rushed back driving through Texas to pick her up in Taos at midnight to say goodbye before the school year. While she was in the middle of talking, he leaned over and kissed her for the first time. Her world was completely blown. The timing was hilarious and tragic, but she was absolutely smitten.Aurora returned to school the next day, they weren't dating dating, but she could not get Juan out of her head. Amidst opportunities to get back with Aurora’s college boyfriend or go on coffee dates with new people - Aurora didn't want to even chance ruining the opportunity to be with Juan, and she stayed single. About a month into the semester, Juan joked about coming to see Aurora in North Carolina, and then within a few weeks he showed up. In a whirlwind weekend of falling hard for one another, they decided to become official - Facebook official - that’s when you know it’s really real. 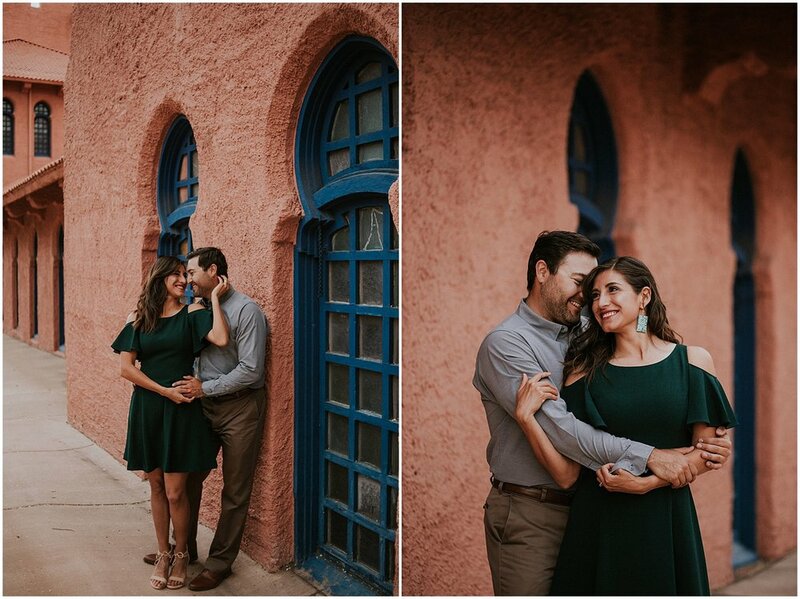 Aurora and Juan have been through so much and I love the two of them together so when it came time to photograph their engagement session, I knew it had to represent their love story in a way that stays true to them. which is a little more formal. She also had them in warm colors because their wedding is in the fall of 2018. The outfits also matched where they are in their lives and how they pride in themselves as young professionals. She also helped Aurora pick accessories that made her feel more like herself - Aurora’s outfit was a mix of Native and Spanish influences. Marisa Lux Makeup gave Aurora a flawless look that enhanced her natural beauty and complimented her outfit perfectly. 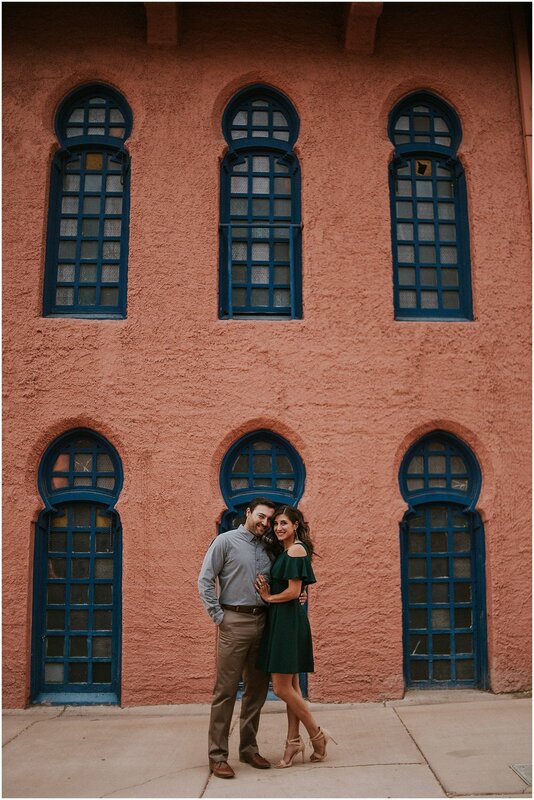 When it came to choosing a location for their e-sesh, it was an easy choice to start our session with the beautiful architecture of the Scottish Rite Temple in Santa Fe and then exploring to Canyon Road. 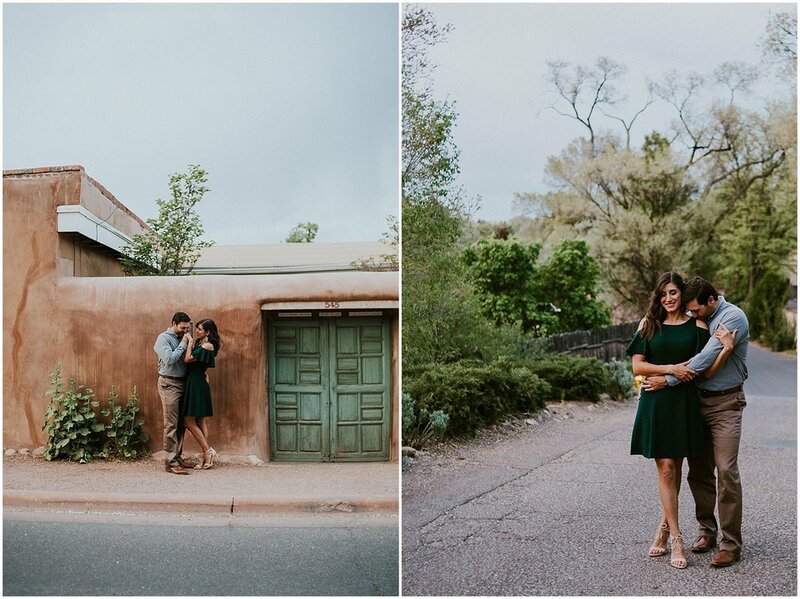 Juan and Aurora like exploring Santa Fe, and pretending to be “Santa Fancy” so that is exactly what we did. Canyon Road was pleasantly calm the time of the year so it was easy for us to get all “Canyon Road Fancy” for their sesh. They snuggled. They laughed hard. They kissed. They danced in the streets of Santa Fe as the sun set. It was the epitome of a New Mexican dream to photograph. 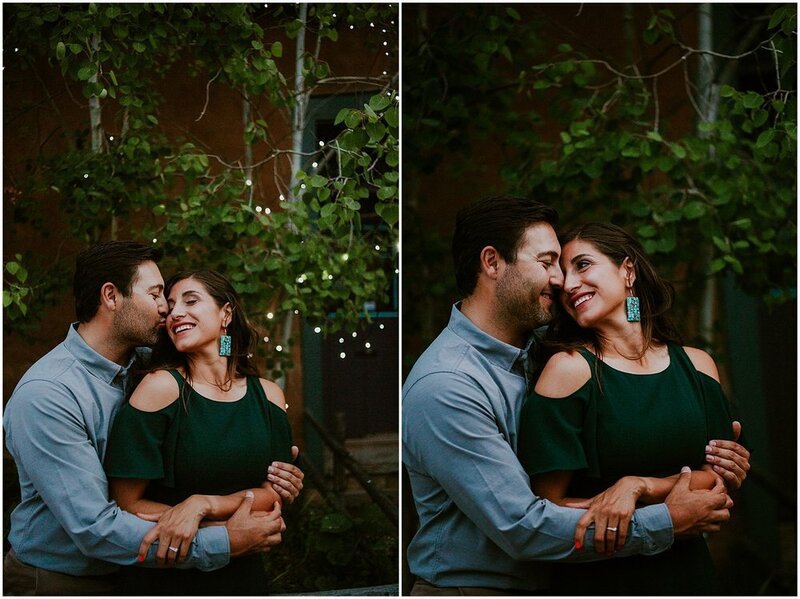 The ristras, the bokeh of the stringlights, their gorgeous smiles, their stunning love, and the beauty of Santa Fe - this sesh will leave you swooning. 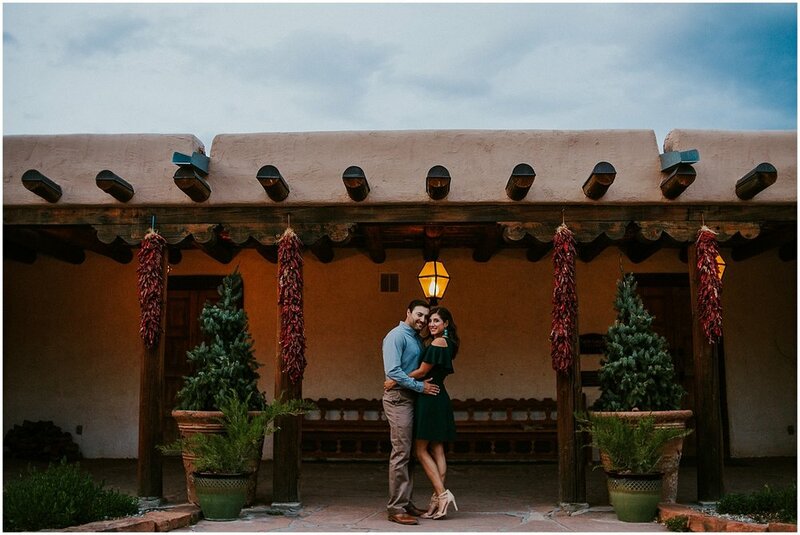 Keep on scrolling to see photos from Juan and Aurora’s gorgeous engagement session, engagement session advice, and more! "The perfect future is a life where we continue to explore and travel. It's a future where we allow each other to gro w and change and love each other through it. It's an excited energy of putting helmets on little kids for a family bike ride after dinner. It's coming back to each other at the end of a stressful day and making each other the main priority. It's being beside each other through both of our highs and lows. Our perfect future is learning new things about everything with each other." "Young, wild, passionate, in love, excited about life, and supporting each other as we build our careers. I know I'll dream about our time in our apartment." "Make out before. Plan date after with your great outfits." "We can't live without a budget that allows us to eat out. We both love cooking good healthy food, but we love going out to eat in Santa Fe. We can't live without our road bikes. We love hanging out with each others family. There's no way we can live without two different closets, I'm so messy and he is neat! We can't live without the mountains. Juan can't live without his skiis or his fishing rod." "Every single day I'm more in love with Juan. I feel safe with him. I feel empowered by his support. I can take the whole world on with him in my corner. There's never a dull moment with us constantly joking around and making fun of each other. As a public health nerd, I adore his commitment to a healthy lifestyle. He makes killer healthy dinners and meal prep lunches. He is always down to go for walks or ride our bikes around Santa Fe. The thing I love the most is how kids just love him. I love how much we talk about our future family and how we want to build healthy habits now which will benefit them - like having a sit down dinner together at home during the weeknights. As a nerd in general, I love how much he loves TV shows about animals, and how Planet Earth is our jam. I love how hard he goes with his hobbies like hydroponics, fly fishing, disc golf, golf, backpacking, and how he wants me right next to him, included in it all. As a Native American, I love how he cares about the things I care about - like Water is Life, Native American rights, health equity, preserving our traditions. And he hates the things I hate - like people who drive slow in the fast lane. I love how protective he is of me - if anyone ever crosses me, Juan will hate that person forever, even if I have forgiven them. There are too many things to love about him." "Jasmine is amazing. I know amazing tells the reader nothing, but everyone comments on how great they love my pictures. I would encourage people to spend the extra money to get Jasmine's eye and talent. She made us feel comfortable and confident."